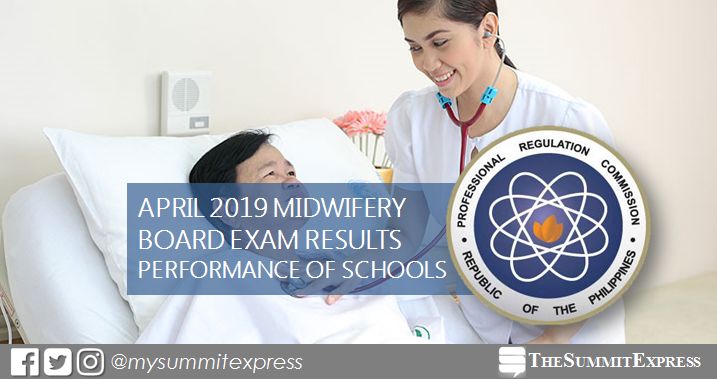 MANILA, Philippines – The Professional Regulation Commission (PRC) hailed the top performing schools in the April 2019 Midwife board exam. The complete results which include the performance of schools are available here. PRC conducted the first Midwife licensure exam this year on April 10 and 11 in the cities of Manila, Baguio, Cagayan de Oro, Cebu, Davao, Iloilo, Legaspi, Pagadian, Tacloban, Tuguegarao and Zamboanga. In the same period last year, University of the Philippines School of Health and Sciences - Leyte was the lone top performing school with 90.80% passing rate or 79 out of 87 passed the exams. In the April 2017 exams, UP SHS-Leyte also garnered the highest place, 96.30% passing rate or 52 out 54 passed the tests. Camarines Sur Polytechnic College - Nabua ranked second with 92.06% or 58 out of 63 passed. Monitor this page for the real-time updates on Midwife board results. Check out also the official website of PRC for more information.